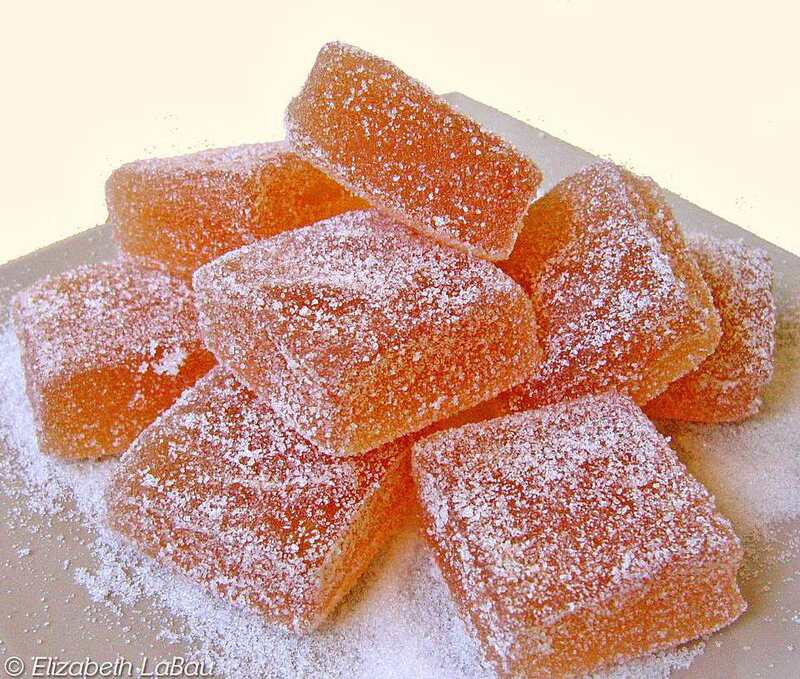 Pâtes de Fruits are a traditional French candy that are sometimes described as a very condensed jam. Basically, they are a fruit puree that is reduced, with a jelling agent added. The result is chewy and vividly, intensely fruity. These Apple Pâtes de Fruits have a wonderful sweet-tart flavor and a great texture. This recipe calls for a vanilla bean to be added to the water when poaching the apples, but you can substitute cinnamon sticks, whole cloves, or any other aromatics that you like to give the apples a flavor boost. This recipe is time-consuming but I think it’s worth it to create such a classic, gourmet treat. Prepare an 8x8 pan by lining it with aluminum foil or parchment paper and spraying it with nonstick cooking spray. In a small bowl, combine the powdered pectin and the first quantity of sugar (1) and mix well. Have the second quantity of sugar (2), the corn syrup, and the lemon juice near the stove, as once you start cooking the candy, the recipe moves quickly and you will need to have everything prepared and within easy reach. Peel the apples and place them in a large pot of simmering water with the split vanilla pod. Poach the apples for 45 minutes or until very tender. Remove them from the water and allow them to cool briefly. Remove the cores and place the apples in a blender or food processor and process until they are a smooth puree. Place the puree in a medium saucepan over medium-high heat and bring it to a simmer. Once simmering, add the pectin-sugar mixture while whisking continuously. Once incorporated, add the second amount of sugar (2) in several batches, and continue to whisk constantly until the candy comes to a boil. Once it boils, add the corn syrup and continue to cook and whisk. Insert a candy thermometer and continue to boil, whisking constantly, until the mixture reaches 225 degrees F. This process takes awhile--usually about 20-30 minutes, depending on your pan and heat. Alternate whisking with scraping the bottom of the pan with a rubber spatula to prevent scorching. At first the candy will be fairly thin, but as it cooks it will thicken and start to spatter, so watch your hands. When it is ready the candy will be quite thick, and will mass together and pull away from the sides of the pan. Once the proper temperature is reached, remove the pan from the heat and immediately whisk in the lemon juice. Scrape the candy into the prepared pan and smooth it into an even layer. Allow it to set at room temperature for at least 3-4 hours, or overnight. Carefully remove the candy from the pan and peel off the foil backing. Cut it into small 1-inch squares and dredge the squares in granulated sugar to serve. Store Apple Pâtes de Fruits in an airtight container in the refrigerator, and roll them in sugar again after refrigeration. How Is Invertase Used to Make Candy?